The high-performance Sport-Fit Plus Galaxy S6 Armband does not just protect your phone while you are exercising, it is also incredibly comfortable to wear. The secure fit and slim design stays out of your way, so you forget you are even wearing it. Now you can concentrate on your workout, not your device. 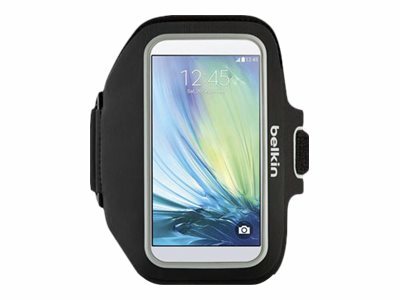 The Sport-Fit Plus Galaxy S6 Armband is made of a stretchy neoprene material that is breathable and hand-washable. It fits snug against your arm to give you full access to your screen without adding extra bulk. Reflective fabric accents keep you safe and visible to others. The Galaxy S6 Sport-Fit Plus Armband's Key Pouch feature is integrated into the strap so you can stash your car, home or gym locker key, or even emergency cash in the pouch.